The America’s Cup may be over but, thanks to the interest and regeneration it brought to Bermuda, the island is still a fantastic investment for property buyers. Surrounded by balmy turquoise seas, this archipelago is perfect for water sports, hiking, golfing or just lazing on the secluded pink-tinged sandy beaches. Despite its rural feel the island also has touches of urban sophistication and over the last few years this “rock in the Atlantic” has been given a luxury revamp with fine dining restaurants and exclusive clubs opening all over the island putting it firmly put back on the luxury real estate map. So, if whilst watching the America’s Cup, you fell for Bermuda’s relaxed pace and natural beauty, here is our pick of the most desirable properties on the island. Lily Lodge, Tucker's Town Completed in 2010 and designed by local firm Lindberg & Simmons to carefully blend traditional Bermudian architecture with modern conveniences, Lily Lodge is one of 11 grand estates making up the elegant Shell Point enclave within the Rosewood Tucker's Point Club & Resort. Located on the water's edge in Castle Harbour, this seven-bedroom residence boasts over 7,140 square feet of interior space along with nearly an acre of landscaped grounds including a private pool, garage, lawn and dock. Inside the spacious bedrooms are accompanied by 7.5 bathrooms, high-ceilinged entertaining spaces and an expansive kitchen. Ideal for families who like to get outdoors, the property is mere minutes from world-class golf courses, beaches, restaurants, spas and the Mid Ocean beach club. Lily Lodge is listed for sale with Christie's International Real Estate with price on application. The America’s Cup may be over but, thanks to the interest and regeneration it brought to Bermuda, the island is still a fantastic investment for property buyers. Surrounded by balmy turquoise seas, this archipelago is perfect for water sports, hiking, golfing or just lazing on the secluded pink-tinged sandy beaches. Despite its rural feel the island also has touches of urban sophistication and over the last few years this “rock in the Atlantic” has been given a luxury revamp with fine dining restaurants and exclusive clubs opening all over the island putting it firmly put back on the luxury real estate map. So, if whilst watching the America’s Cup, you fell for Bermuda’s relaxed pace and natural beauty, here is our pick of the most desirable properties on the island. Completed in 2010 and designed by local firm Lindberg & Simmons to carefully blend traditional Bermudian architecture with modern conveniences, Lily Lodge is one of 11 grand estates making up the elegant Shell Point enclave within the Rosewood Tucker's Point Club & Resort. Located on the water's edge in Castle Harbour, this seven-bedroom residence boasts over 7,140 square feet of interior space along with nearly an acre of landscaped grounds including a private pool, garage, lawn and dock. Inside the spacious bedrooms are accompanied by 7.5 bathrooms, high-ceilinged entertaining spaces and an expansive kitchen. Ideal for families who like to get outdoors, the property is mere minutes from world-class golf courses, beaches, restaurants, spas and the Mid Ocean beach club. Lily Lodge is listed for sale with Christie's International Real Estate with price on application. This magnificent property situated in Tucker’s Town offers dazzling views of the ocean and the south side of the town. 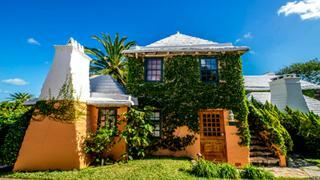 Its large main building and two separate cottages make it perfect for hosting and entertaining guests. Old Battery's reception room opens out onto a double height living room, complete with a cedar-panelled bar and hidden wine cellar, the ideal space for pre-dinner drinks. The upper floor is surrounded by a gallery that looks down on the living room below and the upstairs rooms are made up of a grand dining room, two exquisitely decorated guest bedrooms and a master bedroom. All the south facing rooms open onto the gardens and secluded patios providing ideal spaces for evening drinks and late lunches. Within the grounds there are also two traditional cottages. Bluebird cottage has its own secluded, private beach and tennis courts and compromises three spacious en-suite bedrooms, a cosy living room and open plan kitchen/diner. Powder Keg Cottage is an idyllic one bedroom cottage with breath taking ocean views. The beautifully landscape gardens sweep down to an infinity pool and the private beach below. Old Battery is listed for sale with Rego Sotheby's International Realty for $23 million. 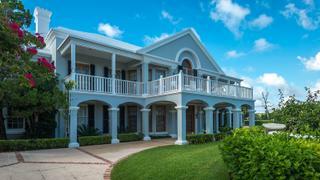 This magnificent property situated in Tucker’s Town offers dazzling views of the ocean and the south side of the town. Its large main building and two separate cottages make it perfect for hosting and entertaining guests. Old Battery's reception room opens out onto a double height living room, complete with a cedar-panelled bar and hidden wine cellar, the ideal space for pre-dinner drinks. The upper floor is surrounded by a gallery that looks down on the living room below and the upstairs rooms are made up of a grand dining room, two exquisitely decorated guest bedrooms and a master bedroom. All the south facing rooms open onto the gardens and secluded patios providing ideal spaces for evening drinks and late lunches. Within the grounds there are also two traditional cottages. Bluebird cottage has its own secluded, private beach and tennis courts and compromises three spacious en-suite bedrooms, a cosy living room and open plan kitchen/diner. Powder Keg Cottage is an idyllic one bedroom cottage with breath taking ocean views. The beautifully landscape gardens sweep down to an infinity pool and the private beach below. Old Battery is listed for sale with Rego Sotheby's International Realty for $23 million. 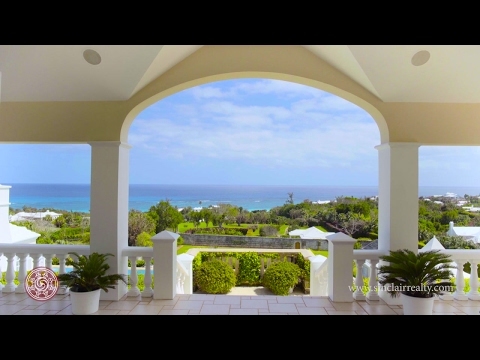 Bellevue is an elegant five-bedroom property just five minutes from the city of Hamilton and is located in one of Bermuda’s most elegant residential enclaves. Offering elevated views of the city and harbour, this Grade I listed property is a timeless classic. The ground floor seamlessly flows from the foyer into the large kitchen and dining room. The five bedrooms are all situated on the upper floor and each has been gorgeously renovated with three boasting wood-burning fireplaces. 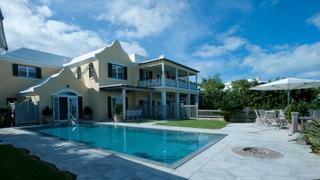 Both floors are surrounded by a traditional Bermudian cedar veranda with views overlooking the south shore. Beautiful manicured lawns flow from the house towards the private pool and tennis courts. On each side of the property are two smaller cottages, each with an additional two bedrooms and kitchens. Overlooking the pink sands and turquoise waters of coveted Grape Bay, this grand beachfront estate has undergone a careful renovation resulting in a private family compound of the finest calibre. The main house is spilt over three levels and is light and spacious. Floor to ceiling windows, French doors opening onto numerous balconies and generous room proportions are Cheston’s hallmarks. There are also many unique features the dining room that was painted in China specially for Chelston. And, if you don’t get chance to visit some of Bermuda’s dive sites, there is a saltwater aquarium built into the wall of the library. In addition to the main house, the property also has three further three bedroom guest cottages, a pool house and a charming beach pavilion with a wood-burning pizza oven - perfect for beachfront lunches or casual dinners. Chelston is listed for sale with Christie's International Real Estate and Sinclair Realty Bermuda for $35 million. Overlooking the pink sands and turquoise waters of coveted Grape Bay, this grand beachfront estate has undergone a careful renovation resulting in a private family compound of the finest calibre. The main house is spilt over three levels and is light and spacious. Floor to ceiling windows, French doors opening onto numerous balconies and generous room proportions are Cheston’s hallmarks. There are also many unique features the dining room that was painted in China specially for Chelston. And, if you don’t get chance to visit some of Bermuda’s dive sites, there is a saltwater aquarium built into the wall of the library. In addition to the main house, the property also has three further three bedroom guest cottages, a pool house and a charming beach pavilion with a wood-burning pizza oven - perfect for beachfront lunches or casual dinners. Chelston is listed for sale with Christie's International Real Estate and Sinclair Realty Bermuda for $35 million. This spectacular waterfront estate, situated in a protected cove off Hamilton harbour, is only minutes from the city. The property is also a stone’s throw away from one of the top marinas on the island, the Royal Bermuda Yacht Club. The main house features 10 bedrooms; each beautifully decorated and featuring traditional walnut woodwork and high ceilings. Vast terraces spread out from the front and back of the property, providing serene locations to watch the sunset. Winding paths lead down to the swimming pool and spacious dock house that has its own lounge and kitchen. Palomera In Fairylands is listed for sale with Sinclair Realty Bermuda and Christie's International Real Estate with price on application. This spectacular waterfront estate, situated in a protected cove off Hamilton harbour, is only minutes from the city. The property is also a stone’s throw away from one of the top marinas on the island, the Royal Bermuda Yacht Club. The main house features 10 bedrooms; each beautifully decorated and featuring traditional walnut woodwork and high ceilings. Vast terraces spread out from the front and back of the property, providing serene locations to watch the sunset. Winding paths lead down to the swimming pool and spacious dock house that has its own lounge and kitchen. Palomera In Fairylands is listed for sale with Sinclair Realty Bermuda and Christie's International Real Estate with price on application. This spectacular gated private estate with stunning harbour views has recently been sensitively restored. At the centre of the property is an elegant, ivy-clad main house that has a large living area, open plan kitchen and diner and eight en-suite bedrooms in addition to two cedar verandas. The property sits within three acres of manicured gardens that are made up of spacious lawns, an opulent fruit orchard, herb gardens and a private tennis court. The private pool nestles within these gardens, surrounded by a sun-filled pavilion. Within the property there is also a recently renovated two bedroom guest cottage, a one bedroom apartment and a caretaker’s cottage. Longford House is listed for sale with Rego Sotheby's International Realty for $10.65 million. This spectacular gated private estate with stunning harbour views has recently been sensitively restored. At the centre of the property is an elegant, ivy-clad main house that has a large living area, open plan kitchen and diner and eight en-suite bedrooms in addition to two cedar verandas. The property sits within three acres of manicured gardens that are made up of spacious lawns, an opulent fruit orchard, herb gardens and a private tennis court. The private pool nestles within these gardens, surrounded by a sun-filled pavilion. Within the property there is also a recently renovated two bedroom guest cottage, a one bedroom apartment and a caretaker’s cottage. Longford House is listed for sale with Rego Sotheby's International Realty for $10.65 million. Commanding a hilltop 90 feet above sea level in Bermuda’s popular Tucker’s Town, Roughill is a stunning estate that overlooks the turquoise water of the island’s south shore. The 10-bedroom property is set over two floors and a separate guest wing. Situated in the middle of the two-storey entrance hall is an eye-catching Australian Cypress staircase that winds up to the spacious second floor. Beyond the French stained glass windows at the rear of the property is a games room and bar that originates from New York’s Waldorf Astoria Hotel. The property also features a wine cellar, swimming pool and spa, outdoor pavilion, exercise room and putting green. 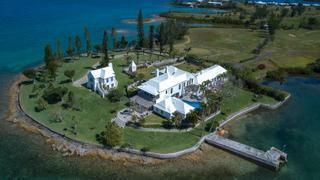 Roughill is listed for sale with Christie's International Real Estate and Sinclair Realty Bermuda for $15.75 million. Commanding a hilltop 90 feet above sea level in Bermuda’s popular Tucker’s Town, Roughill is a stunning estate that overlooks the turquoise water of the island’s south shore. The 10-bedroom property is set over two floors and a separate guest wing. Situated in the middle of the two-storey entrance hall is an eye-catching Australian Cypress staircase that winds up to the spacious second floor. Beyond the French stained glass windows at the rear of the property is a games room and bar that originates from New York’s Waldorf Astoria Hotel. The property also features a wine cellar, swimming pool and spa, outdoor pavilion, exercise room and putting green. 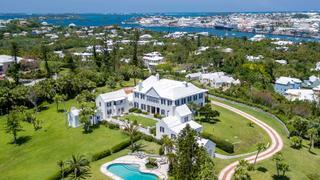 Roughill is listed for sale with Christie's International Real Estate and Sinclair Realty Bermuda for $15.75 million. The Paddocks is a stunning four bedroom contemporary property with spectacular views over the city of Hamilton and its buzzing harbour. The large interior living space is extended into the beautiful surrounding gardens by a travertine-tiled covered pool terrace. The interiors move away from the traditional Bermudian style and have a more European feel. The property is bright and open plan with clean lines and contemporary furnishings. 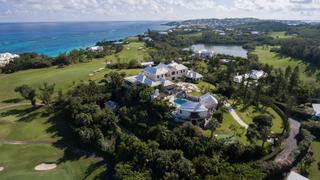 The Paddocks is listed for sale with Christie's International Real Estate and Sinclair Realty Bermuda for $3.9 million. The Paddocks is a stunning four bedroom contemporary property with spectacular views over the city of Hamilton and its buzzing harbour. The large interior living space is extended into the beautiful surrounding gardens by a travertine-tiled covered pool terrace. The interiors move away from the traditional Bermudian style and have a more European feel. The property is bright and open plan with clean lines and contemporary furnishings. 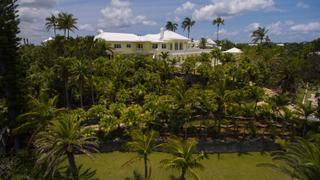 The Paddocks is listed for sale with Christie's International Real Estate and Sinclair Realty Bermuda for $3.9 million. Spectacularly situated on a private peninsula in Bermuda’s beautiful Great Sound this property’s location is one of the most covetable on the island. Originally built in 1720, the current owner has conducted an extensive refurbishment of the entire property. The result is a modern, functional home that has preserved the warmth and elegance of a traditional Bermudian property. The main house offers seven spacious bedrooms each with their own bathroom. The master bedroom is more of a suite than a room and includes a private sitting room, dressing room and veranda. Other living areas in the three-level home include a generous drawing room, perfect for entertaining a large amount of guests, a magnificent cedar panelled library, a cozy lounge and a picturesque garden room that looks out onto the bayside swimming pool. Within the grounds of the property there is also a charming cottage, suitable for accommodating extra guests. Windsong House is listed for sale with Christie's International Real Estate and Sinclair Realty Bermuda for $15.9 million. Spectacularly situated on a private peninsula in Bermuda’s beautiful Great Sound this property’s location is one of the most covetable on the island. Originally built in 1720, the current owner has conducted an extensive refurbishment of the entire property. 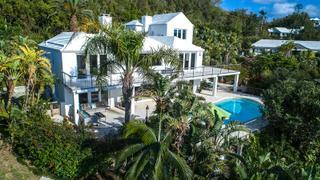 The result is a modern, functional home that has preserved the warmth and elegance of a traditional Bermudian property. The main house offers seven spacious bedrooms each with their own bathroom. The master bedroom is more of a suite than a room and includes a private sitting room, dressing room and veranda. Other living areas in the three-level home include a generous drawing room, perfect for entertaining a large amount of guests, a magnificent cedar panelled library, a cozy lounge and a picturesque garden room that looks out onto the bayside swimming pool. Within the grounds of the property there is also a charming cottage, suitable for accommodating extra guests. Windsong House is listed for sale with Christie's International Real Estate and Sinclair Realty Bermuda for $15.9 million.